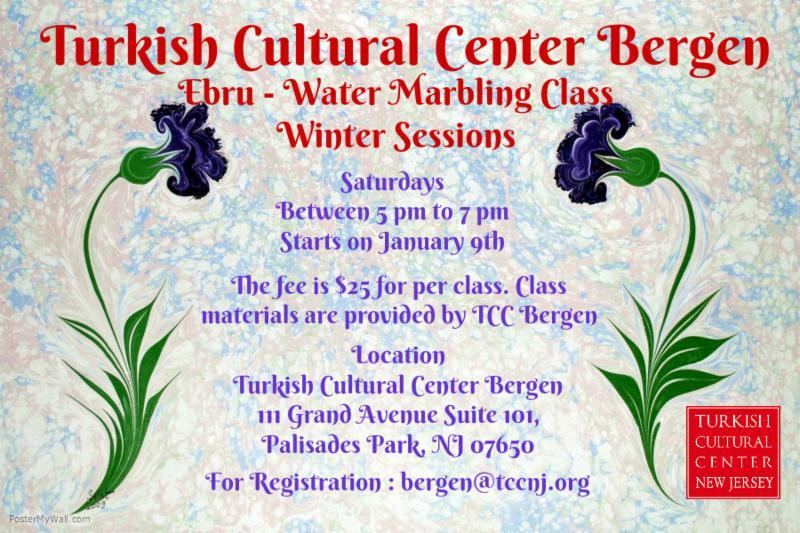 Turkish Cultural Center Ebru Classes are hold regularly at TCC Bergen every Saturday at 5:00 pm and course fee is $25 for per class. Classes are given by an Ebru expert and class materials are provided by TCC Bergen. One of the most unique and beautiful forms of Turkish art is Ebru, or water marbling. Ebru is formed by drawing designs with dye on top of water, and then carefully placing paper on the surface of the water in order to absorb the dye. The earliest examples of Ebru are found in the TopkapiPalace in Istanbul, and are dated 1539, but the detail and quality of the work suggests that Ebru was present long before this time in the Ottoman Empire. Ebru has traditionally been rarely signed, and therefore many great artists remain unnamed. Modern day students may study for more than 10 years before being considered master marblers, learning how to make the perfect dye, water bath, and design. Since each dye bath can only be transferred to paper once, every original piece of Ebru is unique.